The value of pipe #273 is 29 points. John Eells, loves to dicker for pipes. 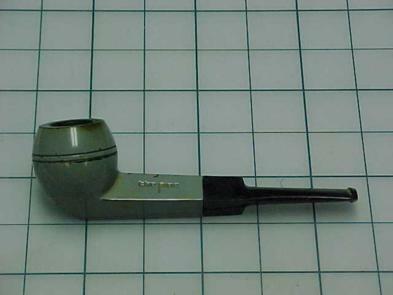 I think he tripled his investment in this rather shabby pipe, but it is the first example I have seen of a grey bulldog, so I was pleased to buy it from him at the New York pipe show in September, 2000. John also gave me a lead to a pipe shop owner who at one time had collected the pipe. Unfortunately, I tracked the fellow down only to learn that he had sold his collection some years ago. Ah, well. I got a better example of a Morocco Grey Bulldog and this one became a smoker while it waited for an offer on the Pipes for Trade page. Eventually it was traded to Rick Osborn in a massive swap-o-rama that left us both better off.